This article offers tips on where to find sunfish during spring. The spring season is one of the best times to catch sunfish as they feed heavily prior to spawning season. 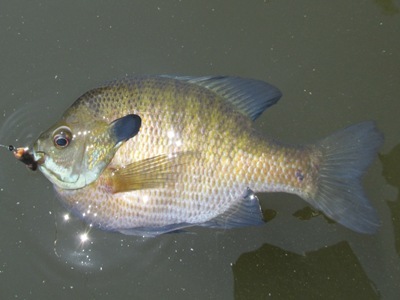 During the spring, bluegill, pumpkinseed, and other sunfish are commonly found in shallow water, especially in areas where aquatic grasses and other vegetation are abundant. Spatterdock (lily pads) can also hold sunfish during spring. In many ponds, small lakes, and backwater areas, spatterdock act as shelter and feeding stations for sunfish. Live trees, fallen timber, and stumps can attract sunfish. Submerged wood often provides shelter as well as food sources for hungry sunfish. Wherever overhanging tree limbs are found, sunfish are likely to be nearby. Areas with overhanging foliage can be particularly important when targeting bluegill and pumpkinseed. Both species rely heavily on terrestrial insects that fall from foliage. Quick to adapt quickly to seasonal food sources, sunfish often take up positions to exploit these opportunities. Although rocky bottoms in moderate to fast moving rivers are generally targeted by smallmouth bass anglers, they can also contain members of the sunfish family. Depending on the waterway, anglers targeting these areas may encounter rock bass, green sunfish, warmouth, red breast sunfish, and other species. Shallow gravel beds and sandbars are often productive during the spring. These areas are more valuable when they are located adjacent to deep water and nearby food sources. In rivers and creeks, oxbows, canals, and other dead-end structures usually hold sunfish. These areas usually contain a variety of food and shelter. Stream outflows can be productive areas during the spring, especially after a rainfall. Even the smallest outflows should not be overlooked as hungry sunfish often congregate in these areas to feed on earthworms and other prey that have been swept downstream. Dam tailwaters are often excellent areas for catching sunfish. Pools below small dams can hold trophy sunfish as well as other fish such as walleye, yellow perch, catfish, bass, and others. During spring, sunfish are often found near spawning areas of other fish, including yellow perch, crappie, bass, herring, and shad. Eager for an easy meal, most members of the sunfish family are quick to dart in and feed on eggs and fry of spawning fish. Sunfish anglers should always be on alert for insect hatches. Often occurring with no warning, these seasonal events can trigger fish into a feeding frenzy. Some insect hatches can be spectacular, involving millions of individual insects along a single waterway. Other hatches are less apparent, but can influence feeding behavior of sunfish and other panfish.